Seven years ago, I began working on a mappack dubbed "Gravity Pack". The pack was originally intended to have 100 maps; I managed to complete about 40 before abandoning the project and subsequently leaving the Metanet community. About a month ago, I decided to pick up N again and played through the maps I had written. There were enough gems in the pack that I decided to try to finish it. Today, I can finally call the pack complete. 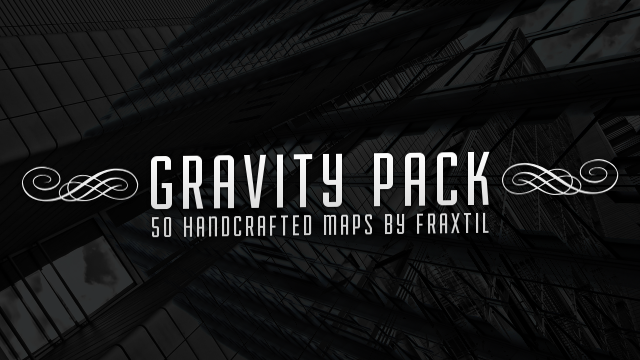 Gravity Pack contains 25 old (pre-2010) maps and 25 new maps. (I discarded quite a few of the original 40.) These aren't particularly groundbreaking or even modern maps; they're just... me. I have a tendency to put design before gameplay, although this certainly isn't to say that the gameplay is neglected. Try them out and you'll understand what I mean. I think the 2014 maps are better than the 200X maps, personally, but maybe you'll disagree. The maps are roughly sorted by difficulty in groups of tens, somewhat similar to what you'd expect from a column-style mappack. Gravity can kill you in all but 3 of the maps. Stages 5, 13, 27, 30, 40, 43, and 49 are my personal favorites. I believe every stage but 32 is possible to AGD, although 19 and 42 may also prove extremely difficult. stage 24: ready for war? Currently through half of it, and it's a decent pack so far, if inconsistent. I will say that one flaw that a lot of the maps share is that they're too long and/or they don't have enough gold. I'm getting a lot of finishing times below 65 seconds, and a few below 30. Serves only as a precursor to stages 28, 38, and 48. Not surprising. Stages 20 and 18 were both very close to being chopped from the original forty maps, along with stage 24. Rose wrote: I will say that one flaw that a lot of the maps share is that they're too long and/or they don't have enough gold. I'm getting a lot of finishing times below 65 seconds, and a few below 30. This is something that I tried to fix as I wrote new maps (see: 06, 10, 23), but I find great delight in coming up with intricate, complicated maps. They're more satisfying to complete, for me at least. I can see how a pack of 50 of them might get exhausting, though. My lowest finishing times across the pack are in the 65-70 second range on stages 38, 39, and 48; everything else is over 70 seconds, and a substantial number of them are over 100 seconds. I don't think I ever struggled with time on any map besides 48. Then again, I know my own maps inside and out, so I guess I need to do a better job of taking that into account in the future. stage 01: gravity rebel >> Uhhhhh, pretty? stage 02: augment >> I really really like how I could skip some of the trap doors. Good one. stage 03: daydreamer >> I do not like the exit switch placement. stage 04: ocean cliff >> Bad gold placement and a lousy design. stage 05: i saw the lights >> Wonderful design, I just don't like the top bit. stage 06: brim >> Hmmm, not much to it. stage 07: abductee >> This... is a buttplug. stage 08: stable >> Not even any gold? Pitiful. stage 09: sparse matrix >> The climb wasn't necessary. stage 10: bismuth outcrop >> Cool tile but not fun at all. stage 11: a simple complex >> Needs a better exit placement. stage 12: glitter >> Skipped. Don't like the seekers. stage 13: what lies beyond >> Actually reminds me of classic '06 NUMA. stage 14: illiterate >> Great tiles with terrible objects. stage 15: super intelligence >> Very clever. stage 16: cynic >> Strange map. stage 17: a fine mist >> Again, very peculiar map. stage 19: the omega directive >> Cramped and boring. stage 20: the slightest imperfection >> These maps keeping getting worse. stage 21: overcompressed >> Tricky tricky tricky. stage 22: dishevel >> This is terrible. stage 23: async >> Much better design but didn't need the outside enemies. stage 25: nothing up my sleeves >> Fantastic challenge. Userlevel'd. stage 26: speak up >> Cool design, I just wish it was easier. stage 27: pipe dream >> A tad bit too cluttered. stage 28: alpha decoy >> The tiles were bad. stage 29: risky business >> Ew. stage 30: melt and join >> Really nice tiles, but I didn't like the thwumps. stage 31: vanishing point >> Artistic, but not fun. stage 32: time's up >> Skipped. stage 33: excursion >> Worse and worse. stage 34: reconfigure >> Hmmm, cool drone idea, but the rest is boring. stage 35: pole juxtaposition >> A bit unfinished. stage 36: alien pentester >> I liked it at first, but the drones got tiring. stage 37: burning buildings>> Nope. stage 38: beta decoy >> Tiles are still poor. stage 39: monolith >> Ugh, it could be sooo much better with proper object placement. stage 40: launch >> Oh, this is cool. stage 41: russian security>> I mean, it's a map. stage 42: jawsome>> Huh. I'm very confused. stage 43: hvac >> I'm a big big fan of the drones. stage 44: obsessive impulsive >> I don't like the layout. stage 45: sidewinder >> It's pretty tough. Maybe fewer drones. stage 46: disurrected >> Skipped. stage 47: golddust >> Fantastic design, but shoddy enemy choices. stage 48: gamma decay >> It would be perfect with only seekers. stage 49: call of the void >> Rough. stage 50: you're already dead >> Going out on a low note. ▲▪►▪▼◄▲ wrote: [*] stage 07: abductee >> This... is a buttplug. ▲▪►▪▼◄▲ wrote: [*] stage 08: stable >> Not even any gold? Pitiful. ▲▪►▪▼◄▲ wrote: [*] stage 20: the slightest imperfection >> These maps keeping getting worse. ▲▪►▪▼◄▲ wrote: [*] stage 25: nothing up my sleeves >> Fantastic challenge. Userlevel'd.